For quite some time people have been waiting for Nathan Eovaldi to turn the proverbial corner because he’s young, talented, and throws hard, and perhaps most importantly because his results haven’t always reflected that reality. Eovaldi is only 25, but it feels like he’s been around for a while. Even though he’s new to the Yankees, right away he began his old routine of posting solid peripherals but ultimately failing to prevent runs. It’s unfair to expect a change of scenery to completely solve a player’s issues, but it is disheartening to see a fresh start have seemingly no affect. Eovaldi wasn’t supposed to suddenly be a star with the Yankees, but he was supposed to progress as young pitchers do. There was a promising development on that front when he introduced a new splitter, but for the first half of the season that didn’t seem to move the needle. It’s certainly moving the needle now. 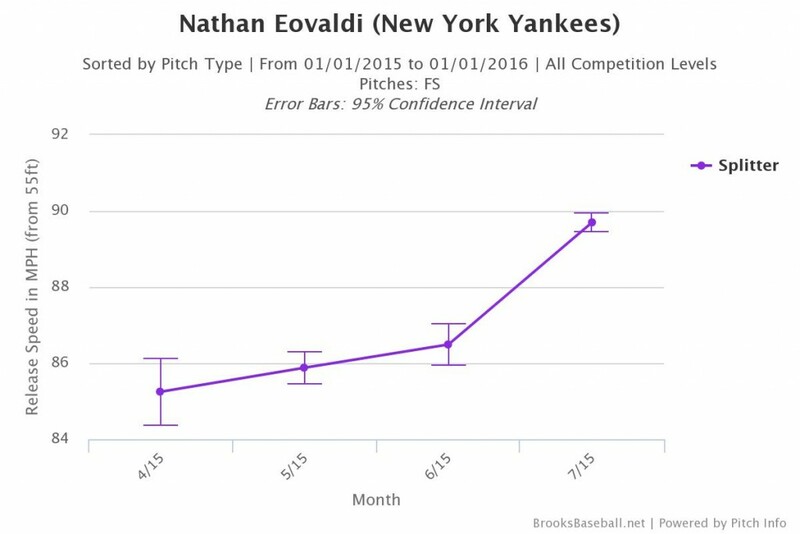 In July, Eovaldi was the Yankees’ best pitcher. He posted an ERA of 3.09 with a FIP of 2.97 and an impressive 0.9 WAR. His xFIP was 3.70, so he was undoubtedly a bit lucky when it came to keeping the ball in the park, but he was undoubtedly good. While sometimes there is no particular reason why a pitcher has a good month, in this case it’s hard to deny his Eovaldi’s increased reliance on his splitter played a role. The right-hander has been increasing his splitter usage all year, but July was the first month that it was was his second-most utilized offering. 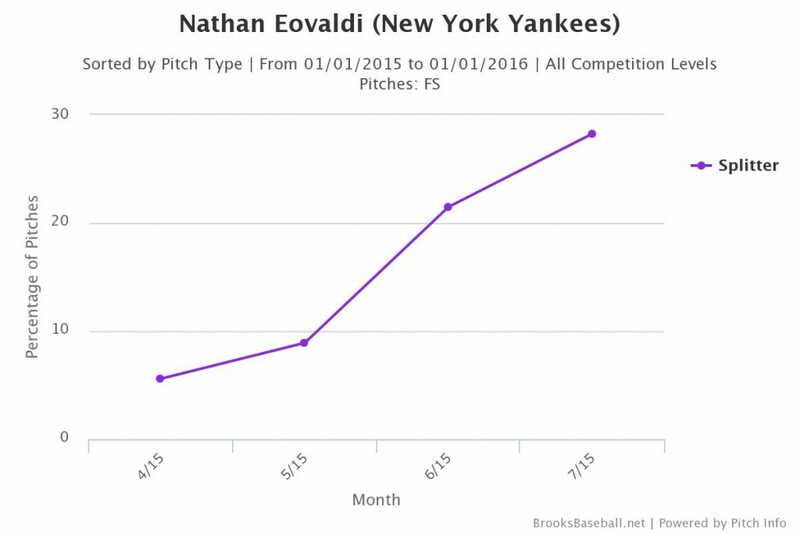 Not only has Eovaldi thrown the pitch more frequently it’s also gained some velocity in recent starts. More often than not a good splitter is a devastating strikeout pitch that has opposing hitters flailing at balls in the dirt. Eovaldi’s is a little different. What makes it special is his ability to get ground balls with it. So far this season 71.95% of batted balls off his splitter have been on the ground. It’s no coincidence that his ground ball rate spiked in July when he began featuring the pitch. At this point we don’t know how far this can go, but in an AL East with dangerous hitters in generous home-run parks, keeping the ball on the ground is generally a very good idea. 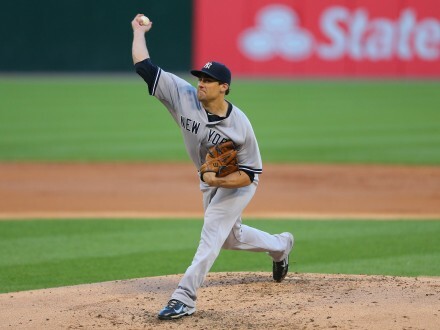 It seems unlikely that Eovaldi can become the next Brandon Webb simply by using his hard splitter, but it’s beginning to appear more probable he can break the bonds of mediocrity that had me comparing him to Ricky Nolasco not two months ago. Right now the Yankees have a hot lineup and a lock-down bullpen, anything that improves their rotation is massively helpful to their chances of not only retaining their division lead but advancing in the playoffs. One way to address their issues is from inside the organization with the likes of Luis Severino. However, their existing rotation members making strides is equally valuable. Right now with the help of his new splitter it looks like at long last Nathan Eovaldi is doing just that.